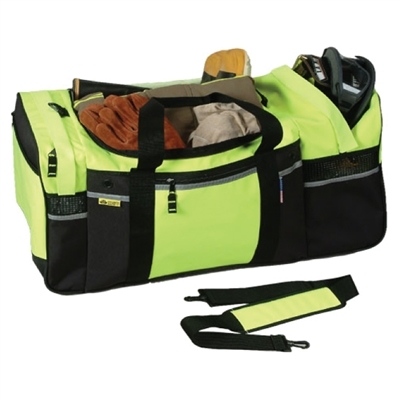 Heavy-duty gear bag provides 3 large, ventilated compartments and 2 zip pockets for easy storage/transportation. U-shaped heavy duty zip opening at top for main compartment. ID pocket & reflective material for increased visibility; sturdy webbing handles with Velcro closure; removable shoulder strap included. 900-denier polyester on PVC upper reinforced double PVC coated on nylon hard bottom.